The Scarab God ends games quicklyPro Tour Champion Patrick Chapin and Resident Genius Michael J. Flores begin their discussion of The Scarab God in an odd context… Splashed in a version of Michael Jacob’s Temur Emerge! 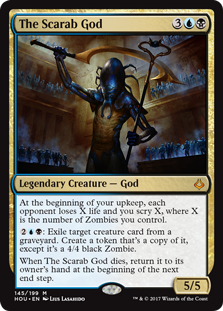 One of the big incentives to The Scarab God right now is its ability to interact with God-Pharaoh’s Gift type decks. 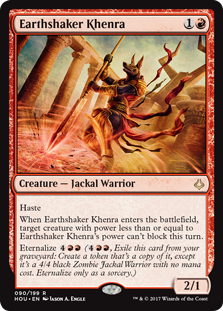 Whether on its own or in concert with Kalitas, The Scarab God puts tremendous pressure on the opponent’s graveyard. 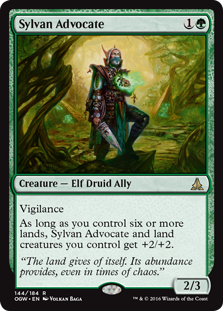 Consequently, the opponent might never have six creatures in his graveyard, say. Angel of Invention is one of the best cards you can reanimate. Patrick likens this combination to Donate / Illusions of Grandeur! 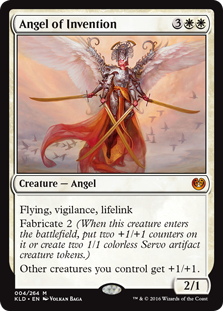 The increased size of Angel of Invention (4/4 to start, when a zombie instead of just an angel) combined with the creature’s natural lifelink protects your own life total while smashing for a ton in the air. 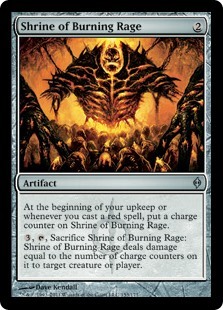 Depending on your archetype, The Scarab God might want to reanimate Trophy Mage. 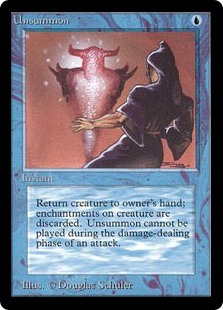 Trophy Mage in the current Standard only has the purpose of finding Gate to the Afterlife (which, in turn, only has the job of setting up God-Pharaoh’s Gift)… This not only gives you potential redundancy but can keep your deck strong through the mid-game, even through multiple copies of Abrade. The two riff on a potential new B/U deck, based on Patrick’s GP Denver Grixis build. This podcast covers many additional topics… Everything from Brad Nelson’s continued dominance of Standard (this time with Temur Emerge) to the U/R Advanced Stitchwing deck, to speculation about post-rotation deck archetypes. Check it out now! 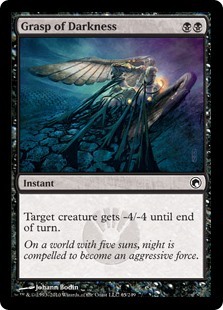 It doesn’t come up super often, but if you pass your first turn with the fetch in play, you tend to want the opponent to fetch for an untapped shock land; they are least likely to do this against Arid Mesa. The two wax on the difference between the two of them playing a first-turn Scalding Tarn. It doesn’t matter which red fetch Michael plays… The jig is up before he ever breaks it. Patrick, though, is a longtime Grixis mage. He would get even more value from turn one Scalding Tarn when playing Burn than most! 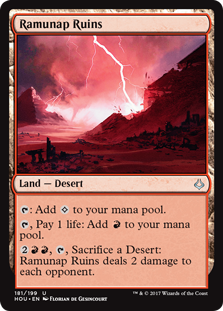 Ramunap Ruins may be the most important new card from Hour of Devastation.Earthsaker Khenra? Yeah! That’s a great creature, we’ll grant you… But it’s still just a creature. Ramunap Ruins can’t be countered and gives players a resource to lean against instead of flooding out.